I truly enjoy being a dentist, not only from a clinical perspective, but from a personal perspective as well. I love having patients that I get to know on a personal level. My team and I have the chance to make a difference in our patients’ lives by providing them with a relaxed environment where the whole family feels welcome. I love having a staff that enjoys coming to work and learning about dentistry. Our practice is like my second family! Continuing education is a passion of mine, as I am dedicated to providing the best quality dental care with the newest technology available. I belong to the Spears Study Club, a local implant study club, and an AGD study club. 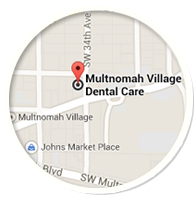 In addition, I take numerous courses every year on general dentistry and periodontics, oral surgery, and orthodontics. I love that dentistry is always changing, and that there are new techniques and materials about which I can learn and use to my patients’ benefit. I have been married to my college sweetheart for 16 years. Chris participates in the practice by doing all of the accounting. We have two children, Dylan and Cody, a Saint Bernard mix named Daisy, three Chickens and two rabbits. . When not at work, I can be found spending time with my family, trail running in Forest Park and Tryon Creek, or hiking in the Columbia Gorge or Mount Hood.